Cut what you see. It's that easy and efficient with Framelits. These wafer-thin chemical-etched die sets feature the perfect registration without interference from any ridges at the edge of the die opening. Plus, they're excellent for clearly cropping photos and cutting windows in cards, bags, boxes and scrapbook pages. Designed to cut a single sheet of cardstock, paper, metallic foil or vellum, these dies also make great stencils and are perfect for layering to produce a 3-D effect. 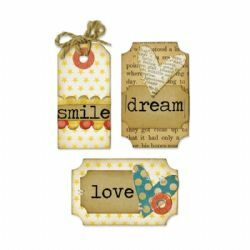 And with the included clear stamp set, there's no need to search for just the right sentiment or embellishment to complement your next cardmaking, scrapbooking or papercrafting challenge. This Framelits Die Set showcases the imaginative style of Stephanie Ackerman. The Framelits Dies in this set are compatible with the BIGkick, Big Shot and Vagabond machines (used with a pair of Cutting Pads and the machine's included Platform; when using the Essentials Platform or Solo Platform & Shim, the Extended Adapter or Solo Adapter is required). All items sold separately.